The Dining Austrian is taking a break from hanging out in Japan, and for reasons unbeknownst to me, decided that he actually wanted hang out with me and eat. Since he has (for now) chased down every restaurant on the planet with 3 Michelin stars, he graciously entrusted me with his itinerary for the next few days. And the first thing I told him? We're spending a weekend in Macau. Which is how I found myself on the 11 a.m. ferry to Macau, sandwiched between Chef DaRC and the Compatriot. Two otakus playing games on their smartphones. The Dining Austrian had taken an early morning flight, landed in Hong Kong, and grabbed the ferry from the airport straight to Macau. 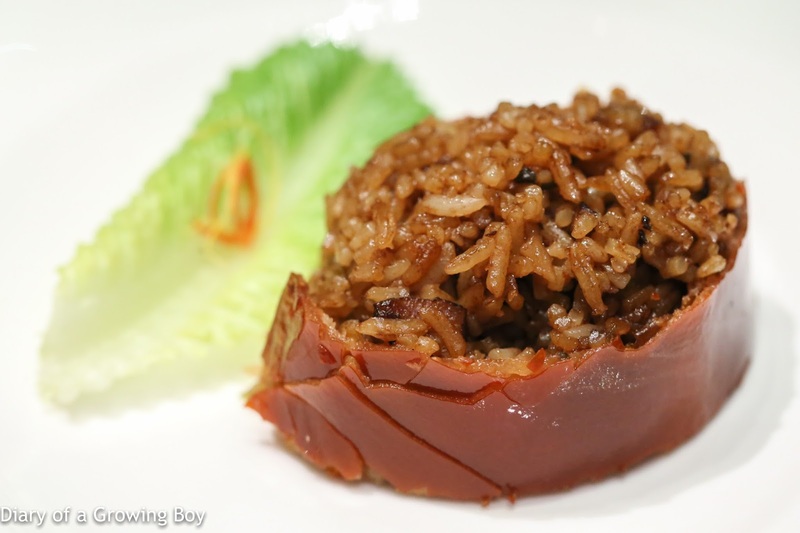 After our rendezvous at the ferry terminal in Macau, we made our way to the Grand Lisboa Macau and sat down at lunch at The 8 (8餐廳). 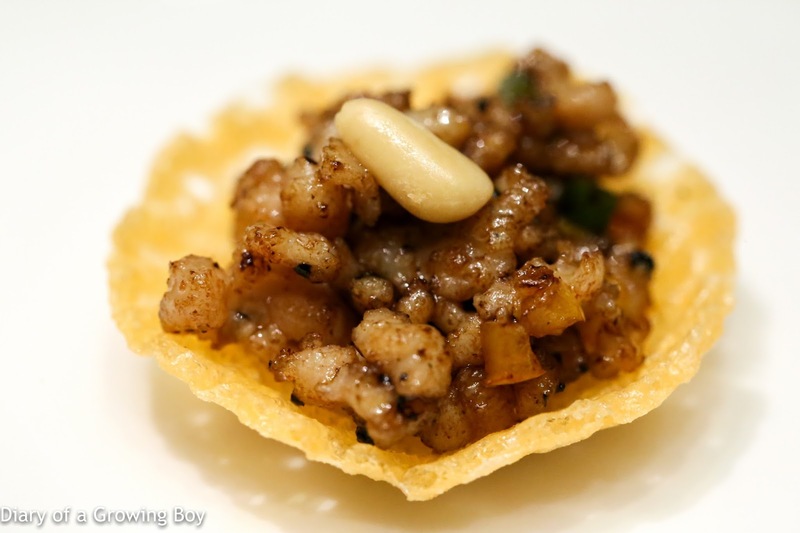 Wagyu beef cubes with pine nuts and peppers in crispy bird's nest - always nice to start with this nibble. Steamed "Shanghainese" dumplings with chicken essence and vintage dried tangerine peel (老陳皮雞汁小籠包) - this is something I've always loved, as they do a really good job with xiaolongbao (小籠包) here. The vintage dried tangerine peel really adds a lovely, smoky fragrance here. The flavors were pretty strong with a slight bitter finish. This actually paired perfectly with our very old German riesling. 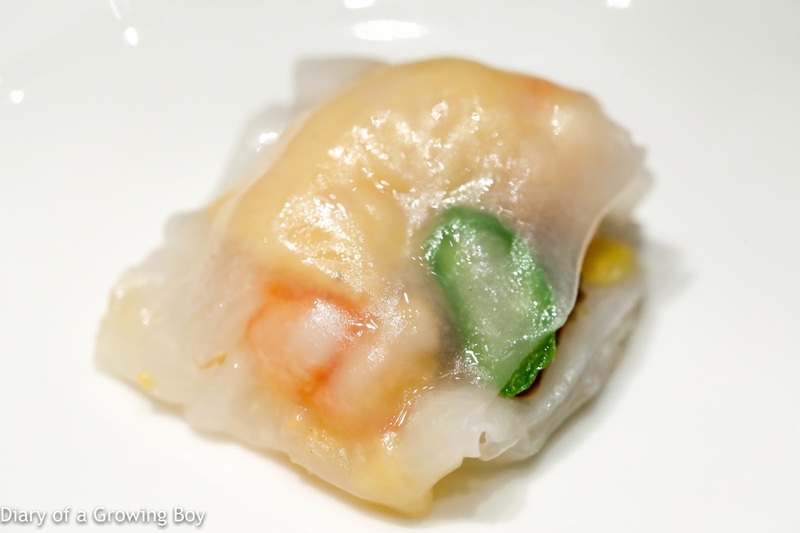 Steamed crystal blue shrimp dumplings in goldfish shape (藍天使蝦金魚餃) - this har gau (蝦餃) with shrimp from New Calendonia never disappoints, and the texture of the shrimp was pretty crunchy. 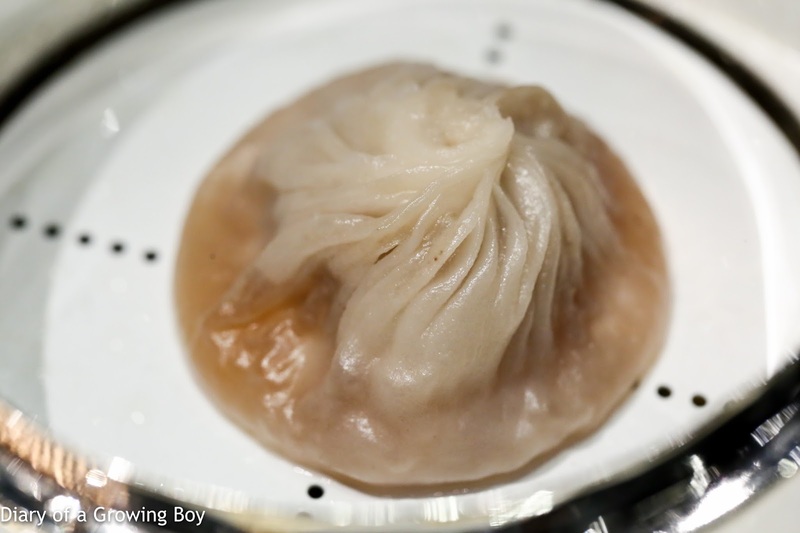 Steamed dumplings with pork and mushroom in X.O. chili sauce (X.O.醬豚肉刺蝟水晶餃) - nice and a little spicy, with a nice fragrance from coriander. Steamed rice flour roll with Sicilian red prawn and matsutake mushroom (義大利西西里紅蝦松茸腸粉) - I found it interesting that the kitchen decided to use what we thought were gambero rosso in the classic Cantonese dish, with thin slices of matsutake (松茸) and asparagus. 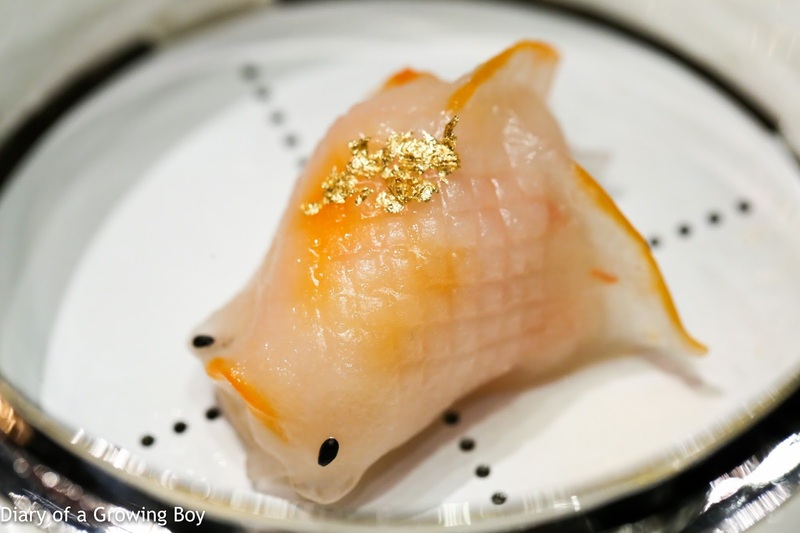 This came with soy sauce which had been fermented with shrimp shells, which definitely delivered extra umami. 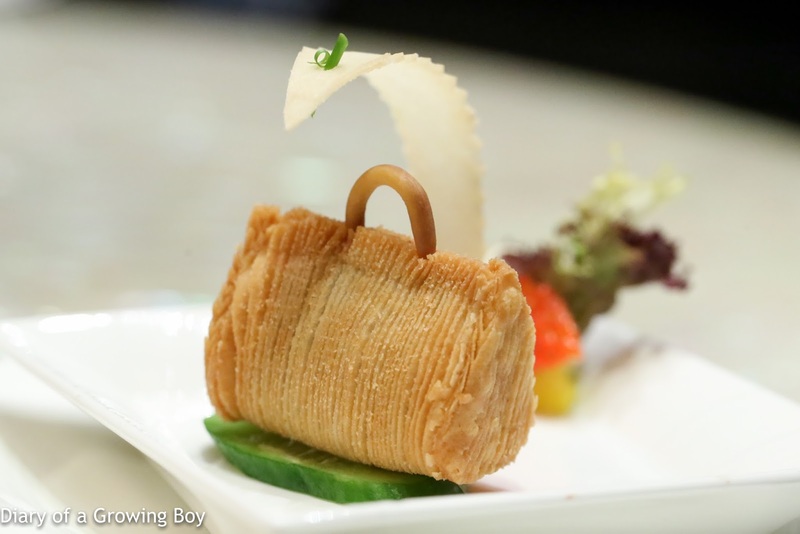 The puff pastry was certainly well-made and had the right texture, while the combination of spicy minced pork and crunchy river shrimp was pretty tasty. 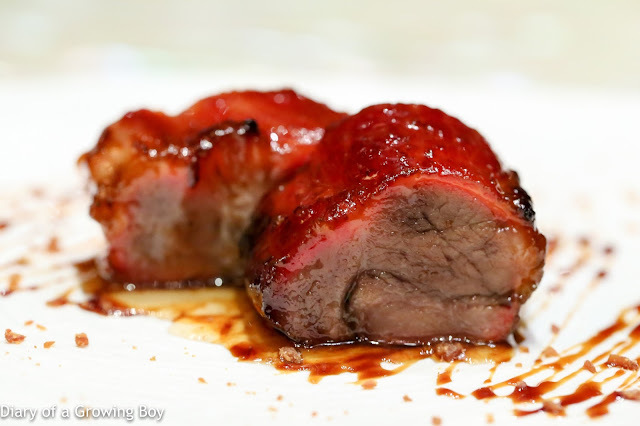 Barbecued pork (玫瑰蜜汁叉燒) - still one of my favorite char siu (叉燒) around. So, so, sooo tasty and satisfying. 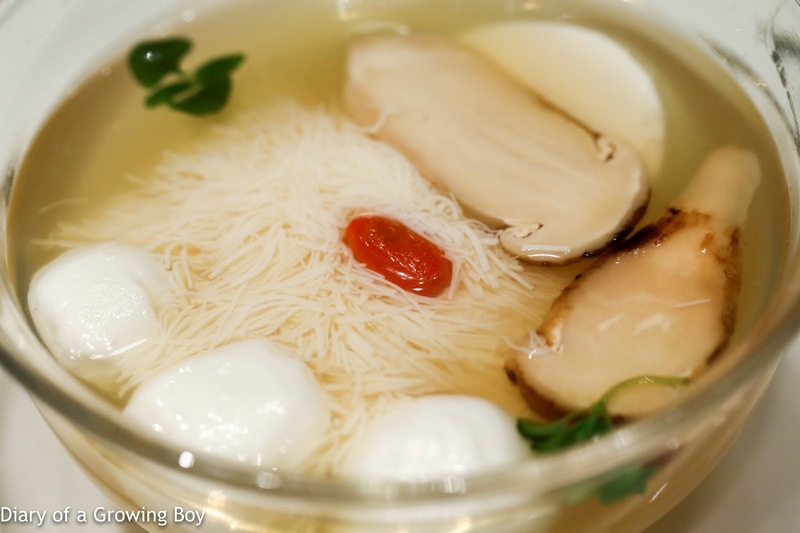 Chicken broth with fish delicate and bean curd in chrysanthemum shape (菊花魚圓) - I had to order this soup in order to show the knife skills of the chef, but Chef DaRC noticed that the strands were of varying thickness... Well, I was still happy to have this, and the little fish balls were delicious - with an airy and bouncy texture. 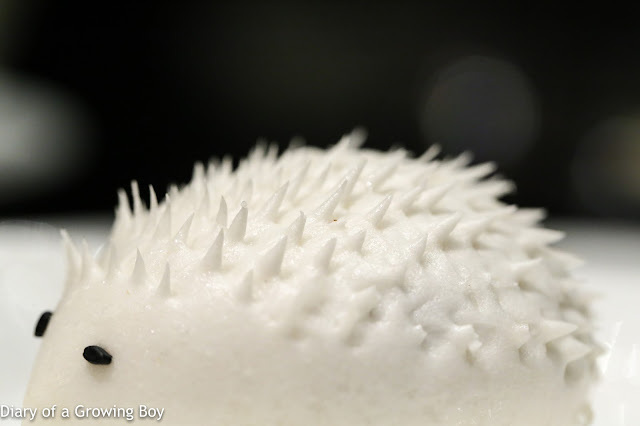 Crispy barbecued pork buns with preserved vegetables (脆香叉燒包) - I always enjoy eating these cute char siu baos (叉燒包), so I'm happy to order these porcupines, whose spines have been snipped with a pair of scissors by hand. 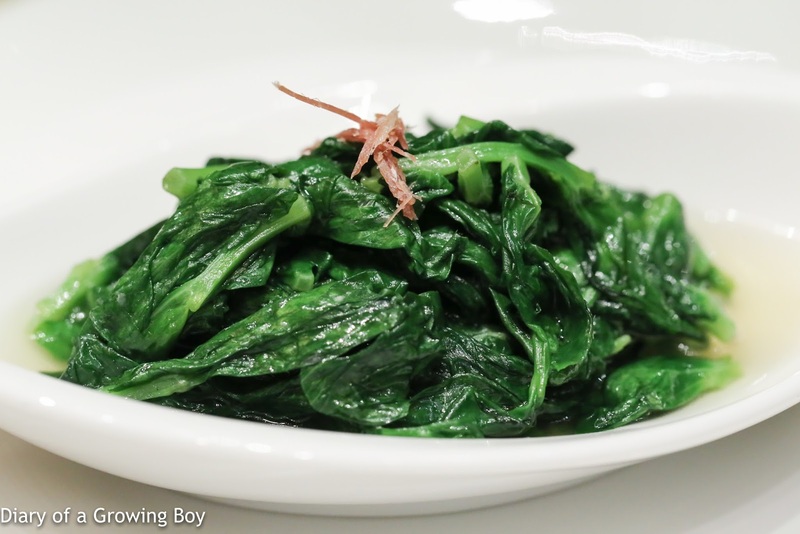 Pea shoots in superior broth (上湯豆苗) - Chef Joseph Tse proposed this for us, and it's always good to have young pea shoots in season. 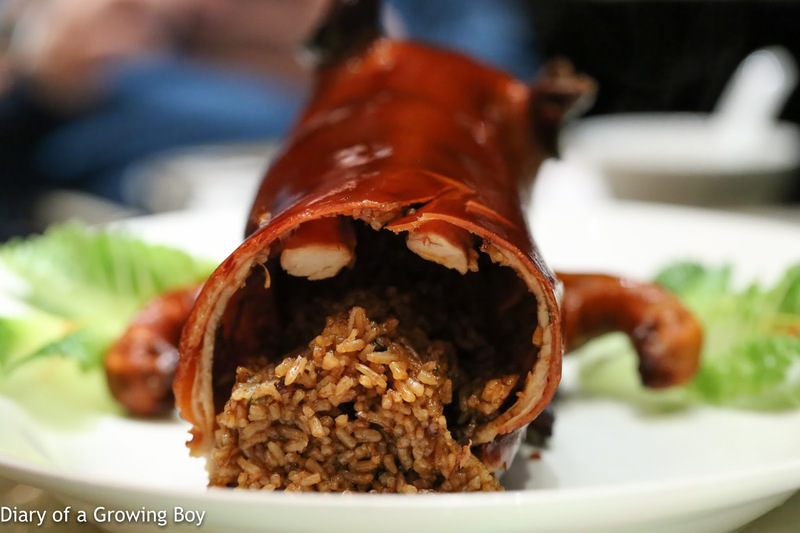 Suckling pig filled with fried rice and preserved meat (原隻乳豬焗飯) - OF COURSE we had to do this. 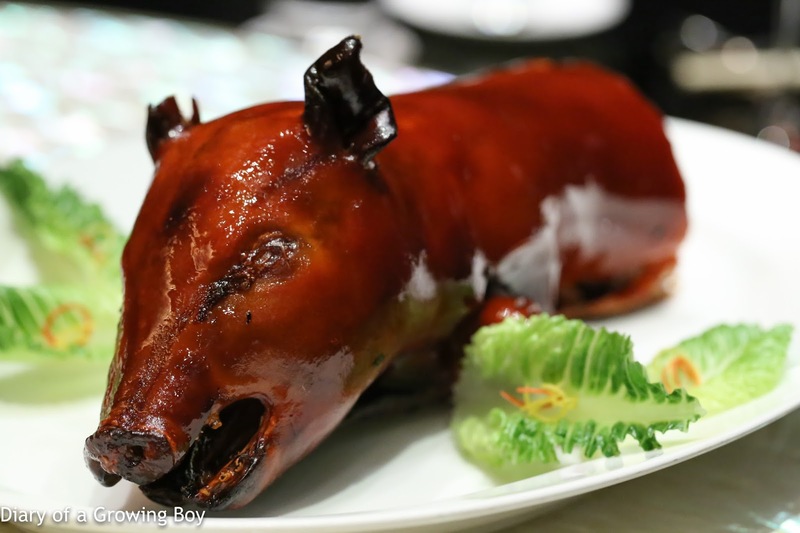 It has been far too long since I last had the stuffed suckling pig here, and I knew the guys would like it. Coffee jelly (咖啡啫喱) - this has always been my favorite dessert here, and I needed my fix. 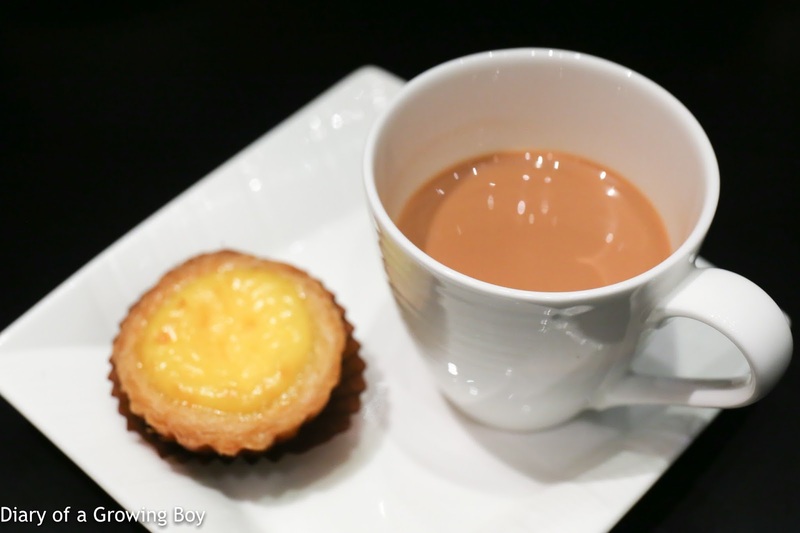 Portuguese egg tart (葡式蛋撻) and milk tea (奶茶) - still my favorite milk tea. The focus of this meal was never going to be about the food, but rather on the German rieslings we were drinking. 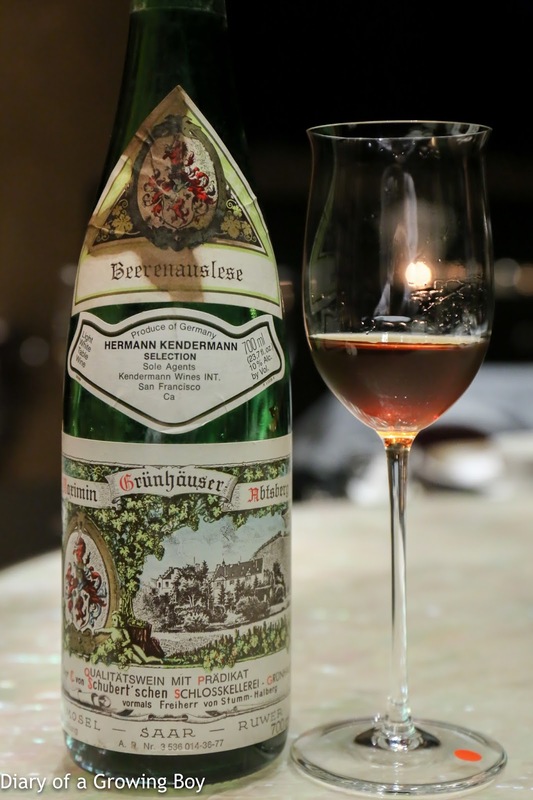 I went through the 190-pages of the German riesling section of the wine list with a fine-tooth comb, and came up with a short list to propose to the group. 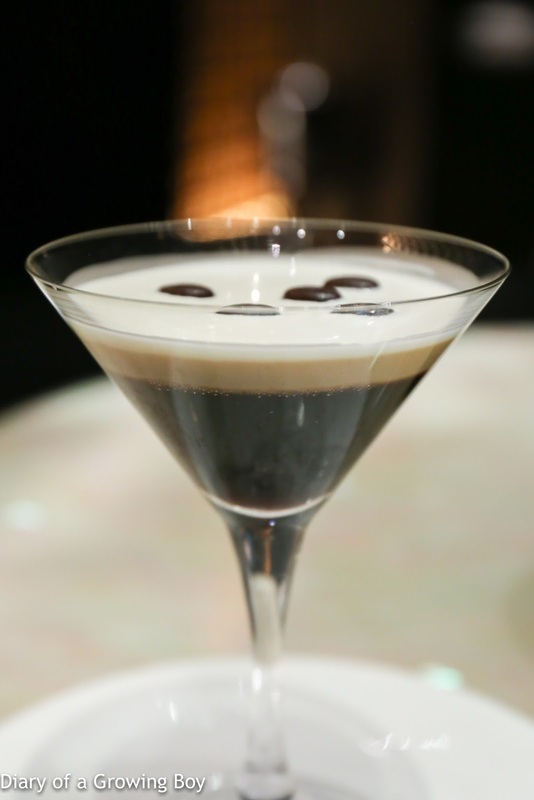 Eventually we settled on two bottles, and I asked restaurant manager Nigel Chan to have them ready when we arrived. 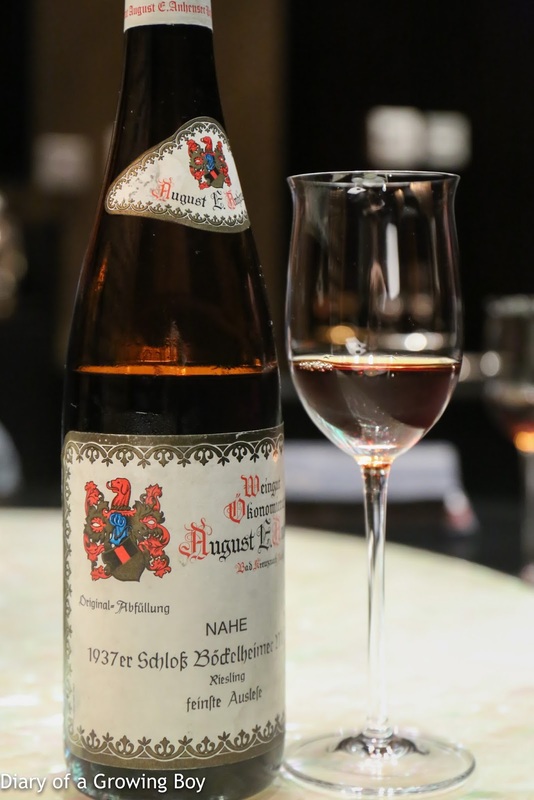 We had initially picked 1971 von Hövel Scharzhofberger Riesling Beerenauslese for our second bottle, but we ended up rejecting this bottle. While the bottle was not corked, we did feel that it was not in the best condition. We debated whether to wait for the hotel to fetch another bottle of the same wine from the cellar, or simply to switch to an alternative. In the end we picked something else. I know that Nigel was in a difficult position, as the von Hövel wasn't corked but simply not in optimal condition and "drinking as it should", so we were very grateful that he agreed to write off the bottle. This was a very, very happy lunch for us. All the dishes were delicious, and it's clear that the restaurant spared no expense in terms of using high-quality ingredients. Of course, we were all amazed by the 1937 Anheuser that we wanted to open more bottles of it. I wouldn't be surprised if we make a trip back there very soon! Many thanks to Nigel and team for taking such good care of us.